PUTRAJAYA: IOI Properties Bhd will wait for the next cycle to launch its property development projects in Singapore in view of the less-than-robust economic market, said its executive chairman Tan Sri Lee Shin Cheng. However, he said construction work on the two projects — Seaview Collection and the Pinnacle Collection in Sentosa Cove — would go ahead as planned. Speaking to reporters after the company’s EGM here yesterday, Lee said the time was not right to launch both the projects and “the next cycle will be higher than the previous cycle”. IOI Property, through a joint venture with Ho Bee Investment Ltd, is developing the Pinnacle Collection, which comprises seven 18-storey blocks and one 20-storey block of luxurious condominiums, while Seaview is a luxury condominium development comprising two eight-storey apartment blocks. The group has a total of 4,500 acres (1,821 hectares) of landbank in the Klang Valley and Johor. It also plans to develop 543 acres of land in Putrajaya into high-end bungalow lots and condominiums which would be launched next year. On the issue of windfall tax which will affect IOI Corporation Bhd’s plantations division, Lee said the group was disagreeable to the tax as the industry was already paying cess to the Malaysian Palm Oil Board, in addition to levies imposed in Sabah and Sarawak, apart from their subsidising of cooking oil. “There is no country in the world where planters are subsidising manufacturers,” he added. Last week, the government had announced the removal of the cooking oil stabilising scheme as part of the subsidy restructuring scheme and replaced with windfall tax. According to Lee, IOI was also finalising a US$100 million (RM325 million) investment as part of its expansion plan in Rotterdam, Holland. IOI already owns a palm oil refinery of 85,000-tonne capacity and would build a 300,000-tonne capacity plant to process margarine. On its previous proposal to buy six plantation companies in Sarawak which would have cost RM439.9 million, IOI’s group executive director Datuk Lee Yeow Chor said the deal had fallen through due to technical issues. “It is not about the price but title. Some pre-conditions cannot be satisfied,” he said, adding that it would be difficult to say if IOI would pursue the purchase of these plantations later. The six companies have a combined plantation landholding of 44,350ha, of which 30.4% or 13,500ha were planted with oil palm. Shopping paradise: 1Borneo is the latest mall to open in Kota Kinabalu Sunday. 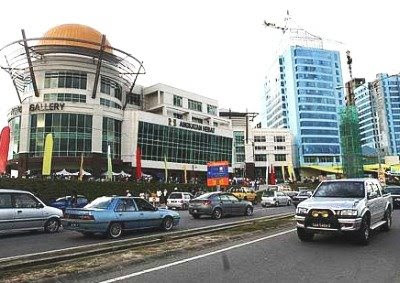 KOTA KINABALU: The opening of Borneo’s largest hypermall, 1Borneo, has the potential to place Sabah among the top regional shopping destinations, Chief Minister Datuk Musa Aman said. He said 1Borneo was an added attraction here for shoppers seeking bargains and branded goods and was part of the state’s efforts to diversify its tourism products, currently best known for its natural eco-tourism activities and destinations. Calling for the tapping of shopping tourists who fly to regional centres like Kuala Lumpur, Manila, Singapore and Bangkok, Musa said it was important for the state to draw in these tourists, especially those living within three to six hours flying time of the city. “We should keep striving to create new attractions and malls such as 1Borneo are one such product,” he said at the soft opening of the RM1.2bil hypermall, which was jointly developed by the state-owned Warisan Harta Sabah Sdn Bhd, Sagajuta (Sabah) Sdn Bhd and United Sabah Islamic Association, owner of the 10ha site. The mall has 139,354 sq metres of shopping area, and among others, has four international chain hotels, condominiums, an Auto City, oceanarium and Discovery Centre, handicraft cultural centre and a cineplex among others. The state was projected to increase tourism receipts from RM2.88bil in 2006 to a whopping RM48.5bil in 2025 through the initiatives outlined in the 18-year Sabah Development Corridor blueprint. Musa also hoped that retailers opening shops in 1Borneo would employ local youths being trained in government and private colleges. The 70,000sq ft covered central courtyard will be the focal point to showcase products and services and for events. By the first quarter of 2010, Mainstay Development Sdn Bhd's creative landmark at Section U8 of Bukit Jelutong in Shah Alam, Selangor, is expected to open its doors to tourists, shoppers and businesses. The freehold Space U8, featuring shop offices on the outer frontage and retail outlets on the inner frontage, will be the first commercial project of its kind there to be built on the Shop Unit Mall Office (SuMo) concept of dual front-age, which combines business and leisure under one roof in keeping with contemporary lifestyles. Mainstay Development chairman Raja Azmi Raja Razali, who was formerly chief executive officer of Fly Asian Xpress Sdn Bhd ( now known as AirAsia X), said Space U8 - named thus "to emphasise spaciousness" - will be erected on a triangular-shaped site of 8.39 acres and comprise 58 shop units housed in four storeys. The 46 intermediate units measure 9,000sq ft each while the eight end units and four corner units vary from 10,000sq ft to 12,000sq ft. The project, which has a gross development value of RM220 million, includes a four storey attached complex with 84,000sq ft that will be occupied by the anchor tenant. The development will have 1,300 car-parking bays and 24-hour security monitoring. Raja Azmi said Space U8 will feature airy corridors, open stairways, spacious units and natureal light from a 70,000sq ft covered courtyard, which will be the project's focal point for tenants and residents to showcase products and services, and for other uses such as weekend markets, events and festivities. He noted the integration of shop units, the anchor tenant complex and bustling courtyard will make Space U8 an ideal commercial hub for professional firms, restaurants, alfresco cafes, banks and retailers. "At an average of RM330psf, it's quite a deal for Space U8's commercial units in hotspot such as Bukit Jelutong. Our vision for Space U8 is to make it the shopping haven and preferred corporate address in Shah Alam. "In addtion to the ready population of over 500,000 people here, we also hope to attract residents from the surrounding areas such as Ara Damnsara, Subang Jaya and Klang." The company also intend s to make Sapce U8 a " must do" for tourists. "Just a short drive from the Kuala Lumpur International Airport and Port Klang, Space U8 is primed to be a tourst destination ... we will work with Tourism Ministry and Shah Alam Council on this," he said. The development will be financed by Bank Kerjasama Rakyat Malaysia Bhd. "Some people were sceptical when we proposed the idea for Space U8 which is our first property venture ... the commitment given by the bank is an important part of our plan to establish credibility for Mainstay Development," Raja Azmi added. "So far, 50 per cent of the 58 units had been booked." Space U8 is accessible by several highways such as the North Klang Valley Expressway, Guthrie Corridor Expressway and North-South Expressway Central Link.